Hannah failed her school eye exam this past spring so yesterday I took her to the eye doctor for her first check up. After filling out the typical first visit paperwork we sat down to wait for her name to be called. Naturally, I pulled out my sock and commenced knitting. It wasn’t more than a few moments before one of the technicians came over and said, “Hey, I like that sock you’re knitting!” I was shocked because no one ever recognizes that I’m knitting socks – most people see something small-ish and assume it’s a baby sweater. So I thanked her for the compliment and she said she was a knitter and she asked about the yarn and the magic loop method and it was cool. Then the woman selling eye glass frames came over and asked to see the sock. And she asked about the yarn and the magic loop method and the pattern I was using and then she showed me her current sock in progress. I told her how to find the Charade pattern online and she told me how everyone in the doctor’s office knits together during lunch and, again, it was cool. And then her name was called and she got up and I got up to follow her into the exam room. And I was feeling very cool. Until I got to the exam room and I realized that I had dropped my sock in progress back in the waiting room. The ball of yarn, of course, was still in my purse, leaving a very long trail back down the hallway, past the reception desk, to the waiting room. Sigh. So much for being cool. 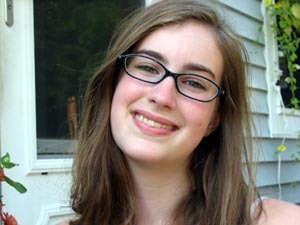 Speaking of cool – check out Hannah in her new glasses. She’s almost as cool as her mom, eh? Funny how those things happen. 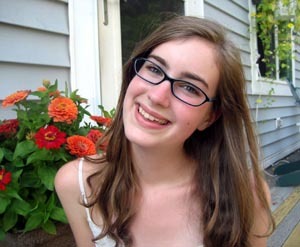 Love Hannah’s new glasses – she is beautiful! Hey, I think you’re cool! You were just showing off the yarn… Yeah, that’s it. Love her new glasses. Tres chic. too funny! 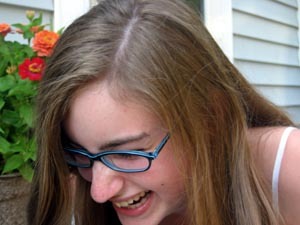 and hannah looks great with her glasses! You were just taking the pressure off Hannah like a good Mom! Hannah looks beautiful in here new specs! And Hannah looks VERY cool. Very very cool. Hannah, yes. Her mom? Of course. Trailing yarn is nothing. Very cool glasses. Cute daughter. Slightly dorky mom, sorry, but it takes one to know one.You can find me trailing bits of yarn in public regularly. Tell Hannah I love her glasses! Cool glasses AND cool story! I wish that fun glasses looked good on me, but I always look goofy with the ones I really like! Tres cool! Hannah looks fab no matter what you put on her. Soooo when can I set her up with my bro’ Evan? Knitting in public-it has its plusses and minuses. I just saw my knitting-inspiration person last weekend, and discovered she has never used circulars! Wow.